“ROMILLY” sailing on the river Yare, southern broads with her recent new rig, which I thought might be of interest to other Romilly owners. The rig was set up by the previous owner a few years back after he bought her from the original owner Bill Stanton (as many will know, Bill was Nigel Irens sponsoring customer for the Romilly design). The rationale was to enable single handed mast stepping for the Norfolk broads. If I understand correctly, either Nigel or possibly Ed Burnett approved the new sail plan. Sail area is equal to the original with the loss of main offset by a furling jib. The new hollow, wooden mast is hand crafted from Canadian Sitka spruce as is the gaff – both very light. The bow sprit is Columbian pine and slots into a cup welded to the side of the new main mast tabernacle. The tabernacle is a robust and elegantly engineered, stainless steel unit mounted on a spike in the original mast slot. There are no fixings; so once the main shroud is released from its cam, aft of the cuddy, the mast starts swinging freely down into the boat. I commend Bill and the yard ‘Adams of Belaugh’ on the quality of materials and workmanship – top drawer throughout. The actual process of stepping is quick and safe – assuming one remembers there are no fixings! The last/ first few yards of lowering/ raising needs a bit of dexterity – handling the mast shroud in one hand and holding up a 6 foot mast crutch in another can get awkward if shrouds, halyards etc choose to get hung up. Whole process maybe 5 minutes. After buying her, in the first week of a blustery, chilly May this year I took 2 days to sail the 50 miles from the owners home on the northern broads to my home stretch of river on the southern broads. I lost count of how many times I stepped the mast, possibly 7 times. I sailed pretty much the whole way, motoring only through the closest set of bridges. Compared to any other boat I’ve sailed, stepping is a trivial task. Okay it goes up and down – how does it go? A brief caveat on my sailing experience – I’ve done a day skipper practical week and crewed for a few weeks on yachts but I’ve mainly sailed dinghies and windsurfers so I’m new to gaff’s and mizzens. As such I didn’t know what to expect of performance, I’d heard good things but I didn’t buy it ostensibly for speed, also I cant yet offer a comparison with the original rig. Since my solo delivery trip I’ve sailed her 2 to 3 times a week for the past 5 weeks in all sorts of conditions. She does point to windward well, better than I might have expected. She makes surprising headway tacking up narrow broads even against a couple of knots of tide. As any broads sailor will know this can be a deeply discouraging experience in the wrong boat. I now know not to over sheet the main. I pretty much just leave the mizzen up – only found it to get a bit squirrelly down wind in a strong blow but otherwise it seems to add power and control up into wind. Not sure how the mizzen performs without benefit of the jib under original rig – will she get stuck in irons? The current sheet arrangements for both jib and main are not ideal (failing health of previous owner means I think that this rig hadn’t been used much or fettled with). This will be fixed to allow fluid tacks; jib sheets often get tangled with halyard blocks. The ease with which the boom-less main gybes on a run and the low height of the main sheet means the helm is often in danger of being garrotted or hauled overboard by the throat. I’m looking to get a whisper pole and rig up a set of short sturdy stern poles across which I can hang a raised main sheet traveller. My wife tells me I’ve sailed this boat more times in the last 5 weeks than my other boats in the last 5 years (this was not a commendation, rather more confounded expectation). I can say I’ve been delighted at how much this little boat has to offer; an engaging and rewarding sail and a fantastic camping and social boat. Most of my sailing on her has been with at least 1 if not all 4 of our children, plus occasionally my wife and even the dog. I’ve also managed a number of after work sessions with friends and colleagues. Everyone (possibly bar the dog) has asked for another go. Though for some the lure might be the halfway pub stop. I do have to keep remembering that whilst it’s a 22 foot boat, bumkin and now added bowsprit take her closer to 30ft, This can be a bother tacking up narrow broads and I need to remain alert. I relax a little with the children on board, as their squeals of excitement usually give early warning of an impending dig into a bank. They delight in collecting undergrowth and frightening cows. My eldest son’s helming instinct is to treat overhangs as cat would its whiskers and turn when he hits something. Anyway, happily they all shout louder than I swear. Aesthetically, this rig has its charms – it would take a lot more effort to make a Romilly look unsightly. It maybe that a matching tan mizzen would complete the story? Anyway as I’m sure other owners will attest, one receives a lot of credit for just owning a Romilly and this rig doesn’t seem to affect that – it can be hard to politely get away to sail. I do though prefer the look of the original rig – its a big part of what drew me to Romilly in the first place. I’m not sure when it will be appropriate to swap out for the other rig as for the time being I’ll be keeping her based on the broads and this rig is so handy for that. Weather permitting I’ll be taking a trip this weekend round the Norfolk coast, exiting the broads at Great Yarmouth round to Blakeney where we plan to camp for a few weekends. I’m toying with the idea of switching the rig for that, however the current expectation of strong winds and the fact that I’ve been hiding on the broads too long means I may stick with this slightly more versatile/ safer rig until I get there. I’d be interested in hearing from anyone out there who has experience of rowing one? I have rollocks but no oars (no that’s not the start of joke) and wondered whether the idea is to be discouraged. If you do row what is your setup? My cruising grounds are the Dutch Wadden; lot’s of creeks,, slack water and mud plus weather conditions that can change quickly. I very much like the looks, layout and performance of the boat. I have considered alternative rigs including a gaff rig with a jib but so far have not taken any action (a nice topic to think about when laying at anchor somewhere….) . •	What are the cost of a new rig (mast / mainsail / jib) as described? •	Is it at all possible to put the mast further aft allowing for a larger jib without a bowsprit? •	To what extent does a gaf rig affect the sailing performance? 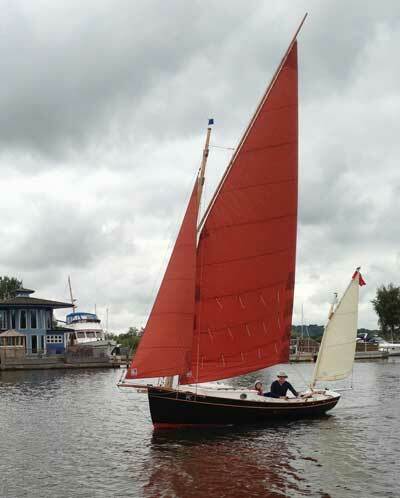 I have seen pictures of a Roxanne with a gaff rig (without bowsprit) Does the same layout exists for a Romilly? To your first point – I’ve seen the invoices showing the cost of this job at close to 4k GBP including VAT. This covers labour and all new materials to design and build the mast, gaff, bowsprit, tabernacle and all standing and running rigging and a brand new main and jib. The chap I bought from was proud that all the work, including mast construction was done entirely by hand – no electric tools. While I value the high quality result, I’m generally suspicious of an artisan ethos and worry that it may have contributed to unnecessary cost. I dont have the breakdown of labour v materials but if I were having it done – I’d hope to cut the bill in half by doing more of it myself (with power tools!) and I’d want to look at re-using spare or used materials including sailcloth. Dont expect I’ll ever know enough about boat design to make an educated guess as to how to shift the mast back or what would happen if you did. As mentioned earlier I havent yet compared this to the original but will post here when I do. I am interested that you feel the boat points well. My Romilly has a ‘normal’ rig &, while I love the boat, the one thing I can’t get her to do is point. In normal ‘full sail’ weather I think I am doing well to tack through 90 Degrees. I have wondered whether the ability to sheet the main more centrally would help – which I guess takes you in the direction of a boom ? I would be interested in your thoughts, & other owners thoughts on this. Is the problem with the boat, the sail, or me ? We often lifted out masts by hand on both ROXANE and ROMILLY, but it’s not something I’d recommend, and in any case it takes three people – one to lift the mast, one to keep a heavy foot on the heel of the mast as it leaves the socket, and one back in the cockpit to ‘catch’ the mast. This precarious operation was only possible in flat water with little or no wind. Obviously quite unsuitable for the kind of routine lowering of the mast required for sailing in and around the Norfolk Broads. You have certainly come up with a solution that addresses that problem – based on techniques that have been developed over the years in East Coast/Dutch waters – and it looks fine. I imagine that ROMILLY’s fairly small beam on deck in way of the mast makes shroud angles pretty small, but obviously an unstayed rig is not an option that is compatible with the tabernacle arranngement. In answer to Erit’s comments, I have to agree that the original rig is not the obvious choice if simplicity and ease of handling is the main objective! Sailing both ROXANE and ROMMILY involves all learning all kinds techniques that are speciific to this rig, but making a half- decent job of it does bring a lot of satisfaction – a bit akin to being able to ride a monocycle I suppose, as in ‘not a lot of people can do this, you know’ ! 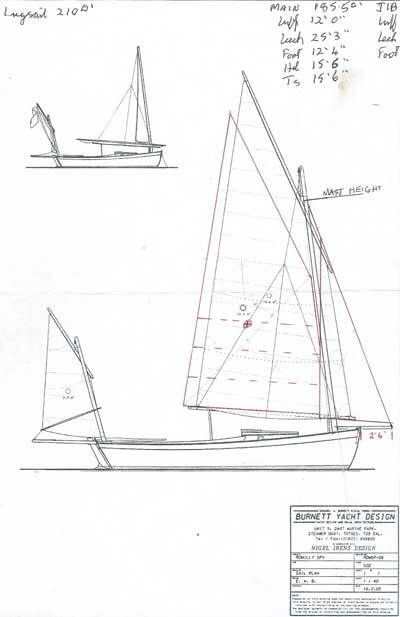 We have, on the other hand, been developing a rig based on a ‘Fat Headed’ bermudan sail on a freestanding rotating rig. It looks well and would be, by contrast, very handy to use. The bad news is that (guess what?) it will be very expensive to build. This rig is currently being pioneered by Philippe Galland (well known to readers of these pages), who has got hold of ROXANE No.8 and is restoring her as well as converting to the the ‘Fat Head’ rig. I’ve no doubt he’ll be writing up this adventure when the boat is back on the water in her new guise. The guy helping Philippe to make this a reality is Theo Rye, a long standing and trusted partner of ours on many a whacky project ! Incidently, to my knowledge at least two ROXANEs are fitted with a deck socket just next to the mainmast, into which is fitted either the mizzen mast or other suitabe ‘gin pole’. If you decide to change back to the original lugg-rigg, I would be interested in buying your gaff-rigg-arrangement. Wouldn’t it be possible to use Antoine Carmichael’s solution he proposes for his lovely Pabouk Love ? : she is too a catboat, and this consists on a special hinge inserted in the original mast. Its a very neatly engineered solution on pabouk love. Some gorgeous photography & video on Antoines site too. I’d think for towing it might be improved if it ‘broke’ higher up and so fit inside the length of the boat either in the slot or folded up. I’ve been running with the original rig now since late last season. I love the simplicity and effectiveness of the original plan. I’ve trailered on several occasions. Rigging is more of a physical challenge but so long as I can find a decent high point i.e. harbour wall, the mast slots in easily enough – easier but not essential to have a spare pair of hands. Whilst its not that convenient for shooting a lot of bridges the occasional one is fine – I tend to travel to find places with less bridges – more sea!